It’s official – the “complete streets” movement has come to South Florida, and not just to Miami and Fort Lauderdale. Municipalities throughout the region are focusing on the need to create transportation networks that do not solely prioritize the automobile. 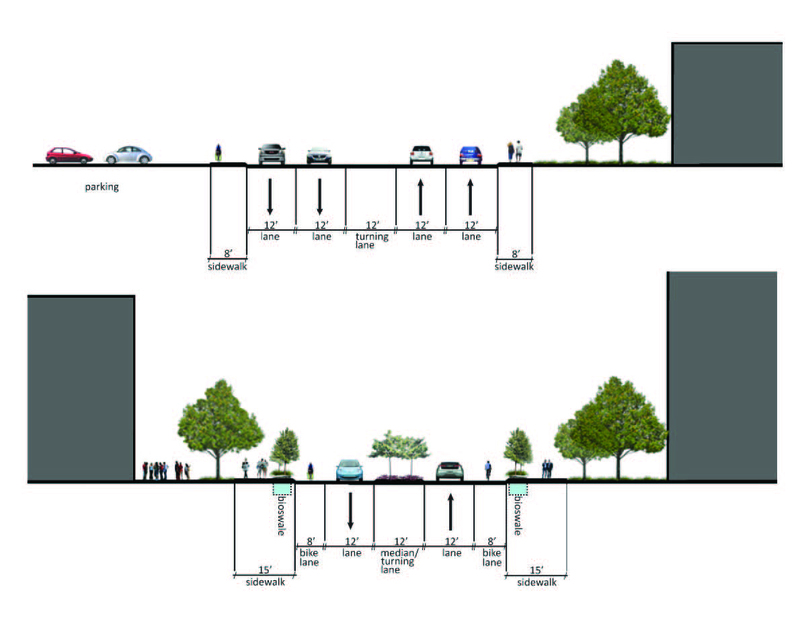 Instead, dedicated bike lanes and shaded pedestrian areas are added into the right-of-way creating safe, accessible, and walkable urban areas that are inviting to stroll — while still allowing efficient automobile movement. These “complete streets” design an environment that allows pedestrians, cyclists, and drivers to all safely use the same right-of-way at the same time with limited interactions, resulting in limited danger. A “complete street” is defined by Smart Growth America as a street where, “everyone, regardless of age, ability, income, race, or ethnicity, ought to have safe, comfortable, and convenient access to community destinations and public places – whether walking, driving, bicycling, or taking public transportation.” (https://smartgrowthamerica.org/program/national-complete-streets-coalition/) When put in practice, complete streets create separate zones within the right-of-way; areas for pedestrians, cyclists, and (of course) automobiles. Since urban streets traditionally prioritize allotting space to both cars and pedestrians, it’s the addition of bike lanes that is the big news. With so many diverse types of streets and street conditions, retrofitting existing roads into complete streets can take many forms. There is no one way to update a roadway to a complete street; the method and exact layout are flexible, but they do follow a general set of guidelines. In most cases, particularly in more densely populated areas, these include: reducing the width of the drive lane to slow traffic, creating a separate area for cyclists, and adding street trees to enhance the pedestrian area. SAFETY – Road safety is a key benefit of complete streets, and not just the safety of bicyclists. Studies show that adding bike lanes and street trees help to calm traffic speeds, and reduce car accident frequency. In most cases, bike lanes fall between the drive lane and sidewalk; this helps to better shelter the sidewalk from the traffic, making pedestrians safer. The sidewalks themselves are safer, and bicyclists now have their own space, no longer needing to weave between pedestrians. ECONOMIC – Studies show that complete streets, and bike lanes in particular, are good for local economies, often increasing property values as people want to live and work in areas that are walkable. This is particularly true for millennials and active retirees. Additionally, they can stimulate the local economy. Cyclists and pedestrians are more likely than drivers to stop and walk into stores they pass. Many cities with bike corridors, such as New York, Toronto, and San Francisco, report that the businesses along the bike corridors saw stronger retail sales than businesses in the areas that were not along the route. Because of this, bike routes are often used to spur urban revitalization efforts by helping local businesses while also attracting private investment, since businesses often want to locate in bike-friendly areas to attract young workers who prefer biking and walking to driving. 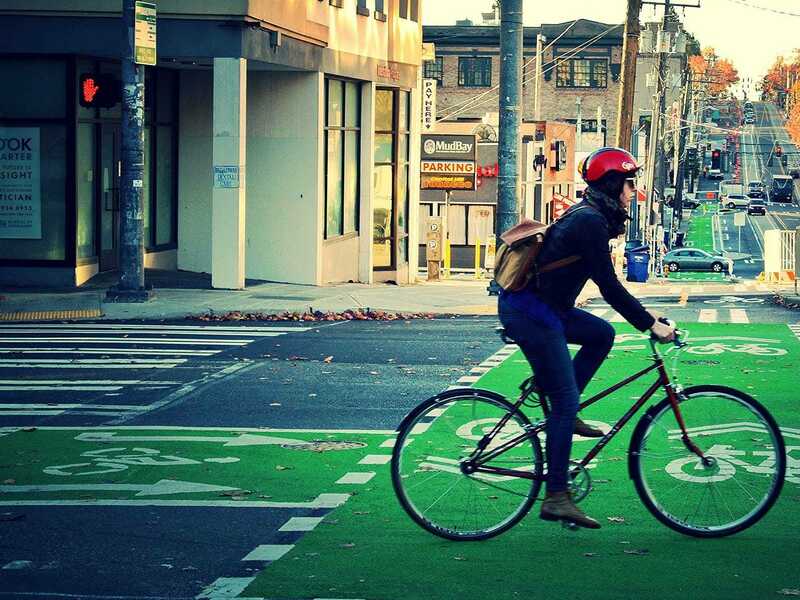 LIVABILITY – As a whole, bike lanes and complete streets create a more welcoming environment for pedestrians, bicyclists, drivers, and visitors alike. This is because they produce a more attractive urban environment — not just because of the shaded, tree-lined sidewalks, but rather as a network of complete streets and bike lanes are completed, more people choose to walk and bike, removing drivers from the road. This does two things simultaneously: first, it decreases roadway congestion and second, with fewer cars on the road, the air is cleaner and there is less ambient noise for pedestrians on the sidewalk. This translates into streets that are more attractive on which to stroll, shop, and live. This article only touches on some of the benefits of complete streets and creating an overall bike-friendly environment. There are many others. That said, it is also important to remember that there is a myriad of different ways to create a complete street and no one prescriptive solution will work for every situation. There are resources available to make it easier to determine which design considerations are right for your street. StreetMix.net is a website that allows you to create visual aids in the form of street sections by setting the width of your right-of-way, then dragging and dropping different complete street components to see what fits. Groups such as the National Association of City Transportation Officials (NACTO) and Smart Growth America have publications and very informative websites that are also valuable resources to find industry-leading guidelines for complete street design. Tabb Ormsby is a senior designer in the Planning Division at WGI. She works on private residential and commercial site planning projects, as well as public projects focused on reimagining existing spaces to be community-centered and well-loved places.